Some changes are coming to Lisa is Cooking. Big changes, to me anyway. I’m moving out of the kitchen where I’ve been cooking for fourteen years. I’ll be leaving behind the spot on our back porch where I’ve shot most of the photos that have appeared on this blog. The gas range with the oven I’m completely used to will be a thing of the past. We’re packing up and moving over, not too far away, to a temporary residence while our house gets rebuilt. It should take less than a year but probably not much less. In the meantime, I’ll be cooking in a completely unfamiliar kitchen with even less countertop space than I have now. I haven’t even figured out yet where I’ll take food photos or where I'll knead bread or where to put the food processor. It’ll be an adventure, or that’s what I’m telling myself. I won’t be able to resist sharing updates about the house project along the way. When it’s done, I’ll be moving back into another different kitchen. This future kitchen will be a little less unfamiliar since I designed it and know where everything will go. I just haven’t stood in it yet. And, the appliances will be new and different, but they’ll be ones of my choosing. I can’t wait to get acquainted. So, I apologize in advance if it takes me a bit to get situated in my temporary kitchen and if my photos look weirder than ever for a year. What won’t be changing here at Lisa is Cooking is the cooking itself. I’ll still be trying all sorts of dishes from every different source I encounter. I’ll still be whipping up things like these Cambodian Red Curry Chicken Wings that I saw in the July issue of Food and Wine magazine. The recipe is from Edward Lee, and it was inspired by the food from the restaurant Senmonorom in Lowell, Massachusetts. I made a minor change to the cooking process, but that’s the kind of change that’s expected. You begin by cooking the wings in a saute pan on the stovetop. When they are browned on all sides, they should be transferred to a paper towel-lined plate and set aside. Then, the sauce was started with shallots, garlic, lemongrass, and ginger being added to the hot pan. After a few minutes, dried chiles like chiles de arbol, soy sauce, fish sauce, cumin, coriander, paprika, nutmeg, and turmeric were added and cooked until fragrant. Last, coconut milk was added, and the sauce mixture was poured into the blender to be pureed. The pureed sauce was returned to the saute pan. This is where I made a little change. 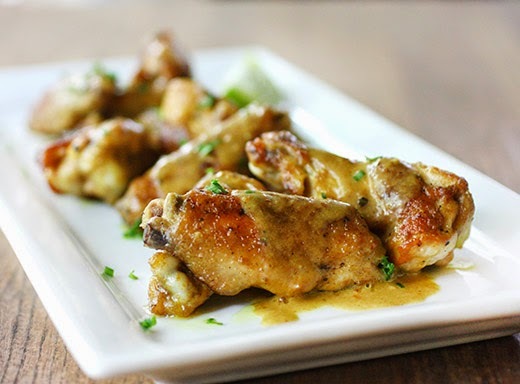 Rather than adding the browned chicken wings to the sauce to simmer for a few minutes, I placed the wings on a baking sheet, basted them with the sauce, and placed them under the broiler. 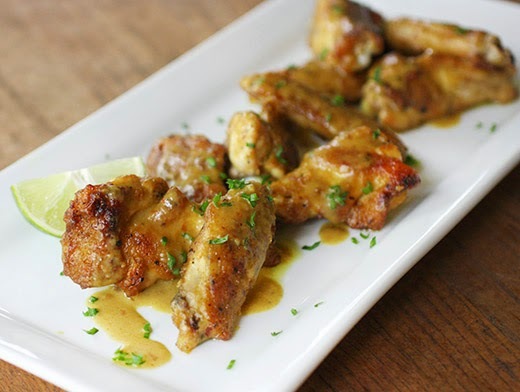 I had a vision of these wings being sticky and coated with the sauce while still having bits of crisp, browned skin. I opted for the high heat of the broiler instead of leaving the wings sitting in the sauce. After basting on both sides and allowing the sauce to achieve a lovely state of stickiness, I served the extra sauce drizzled over the top and as a dipping sauce on the side. As described in the magazine, the flavors are less spicy than Thai but deliciously layered. Served with limes for squeezing and some simple rice and vegetables, this was a fun meal. You have to accept that your fingers will be gooey with sauce, but some of the best meals start with that acceptance. Now, I’m off to pack up more of my kitchen things and get this adventure underway. Good luck for your new project Lisa, I'm sure everything will turn out even better than imagined. The chicken wings look delightful. It all ends well, even if when it all starts the feeling of despair can hit big time... I hope you will share photos of the ongoing renovation, and if you want to get some ideas for how to deal with tiny kitchens, read my blog post "The Nano Kitchen"... I still don't know how I manage to keep the blog going under those conditions - but it was fun and now we have so many memories about those days! Thank you, Sally! I seem to recall that you were able to bake beautiful bread in your nano kitchen. I hope I can make it work a fraction as well as you did. That dish looks and sounds marvelous! I love such flavors. Best luck with your house project, Lisa. These chicken wings look so delicious! I am sure your photos will be lovely anywhere you live, dear. A new house is such an exciting thing, and a new kitchen, designed by you - that's wonderful, Lisa! Thank you, Patricia! I can't wait to see the new house take shape. What an exciting time! Cooking is always an adventure and I know you will embrace all this change with more wonderful recipes! Have fun Lisa! Delicious looking curry wings as well, keeping up that energy level with it! i hope your temporary home brings some unexpectedly great surprises with it! these look yummy, very masterfully prepared! Good luck Lisa...I am sure that everything will be just fine. The chicken looks delicious...packed with flavor. Oh wow, exciting and what a change! I can't wait to see the progress on your kitchen. I have a feeling you will continue to find a way to turn out amazing recipes and beautiful photos. I hope all goes well! What a delicious chicken dish! 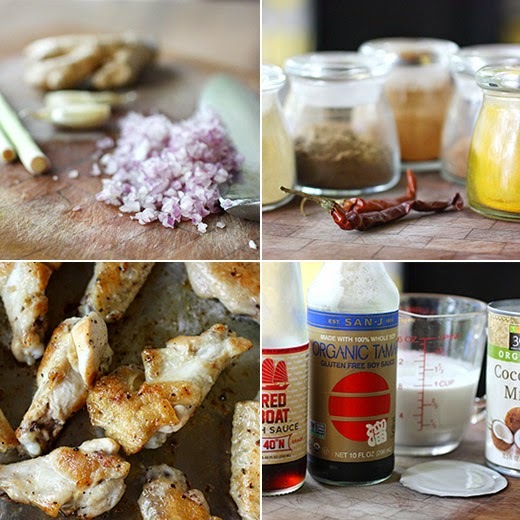 In the meantime, your wings look fabulous, with so many spices and seasonings. Good luck for your home project. The chicken wings look great and I could eat them for a snack. Congrats on the remodel! It'll be a pain at times, I'm sure, but so worth it in the end. And this dish? Well, it's worth it for all of us to make. :-) This looks wonderful -- thanks. Congratulations on the remodel! How exciting! Oh, the wings sound delicious too. Oooh a new kitchen is very exciting! Does the new kitchen come with a new home? These wings are fantastic and something everyone in my home would love! Yes! The whole house will be new. I can't wait to see it take shape.